The simple fact is that the Spark really has no competition right now. There's nothing equipped with the same number of high-end features as the DJI Spark that isn't at least twice as big. It's brilliant. The drone market has one leader: DJI. This fiercely secretive company is able to bring more high tech features to competitively priced products than any competitor. With drones like Mavic Pro already showcasing technologies - not only is it high-tech, it folds down into the size of a water bottle - it left us wondering what the company would deliver next. And this it the answer: the DJI Spark. Somehow - presumably using some form of dark magic - the Spark features a lot of the same technologies as the Mavic, but in a product that literally fits in the palm of your hand. The DJI Spark ultimately looks a little like a much smaller Mavic Pro. There are plenty of ways in which it is different, but it's much more like the Mavic in shape and form than the company's other drones, such as the Phantom 4. The Spark's camera sits at the front on a small gimbal system, and its legs are just minimal protrusions on the underside of the quadcopter. The four arms are situated near the top, meaning there's a good couple of inches of clearance between the propellor blades and the ground. Unlike the Mavic, however, they don't fold away and are completely rigid. Each of the propellor arms has an LED light ring beneath, which shine different colours depending on various situations. In the gesture control mode, for example, they show solid grey to confirm they recognise your palm. Or they flash yellow to tell you you're too far away or too close. Similarly, they change colour during the take-off process: when taking off from your hand, they turn red to let you know that you can let go and the drone will then hover in place. The top surface of the drone is covered in a plastic shell, which - for the first time for DJI - comes in a variety of bold colours. You get the choice of white, blue, yellow, red, and lime green. A lot of the Spark's body is taken up by its removable battery, which has a sliding mechanism on each side to release the latches holding it in place and making it easy to remove. Near the front in-between the front feet to the underside, there are a couple of sensors and a camera used to gauge distance from the ground, your palm or any other surface. Near the top, above the camera, there's an almost fully opaque panel covering another couple of sensors uses for the obstacle avoidance system. At the back you'll find a flap covering the microSD and microUSB ports. DJI Spark is the company's first drone featuring the ability to be controlled using just hand gestures. 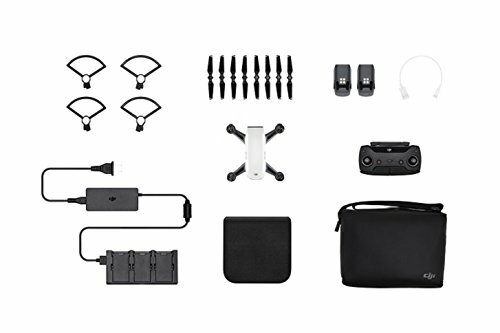 DJI is so confident with this control method that you can buy the drone without a remote control. In our experience, as with any breakthrough new features in many products, the feature wasn't 100 per cent consistent. Indeed, it only worked beginning to end around 50 per cent of the time. But when it did work it felt like pure magic. Summon your inner Jedi. Holding the drone in one hand, with fingers far away from the blades, a double tap of the power button starts the Spark's tiny little motors. They gradually speed up to the point where the drone is ready to fly and the lights at the front turn red informing you that you can now let it go. Let go, and it hovers in place. Just like magic. With arm outretched, fingers closed pointing upwards, and palm towards the drone, look for the green lights to confirm the Spark has locked onto your hand. Then it's possible to gesture up, down, left or right and the Spark follows. If you're too far away or too close, the drone lights flash yellow. When it works, it's great: the drone follows movement slowly and smoothly. However, we found that many times the drone just didn't lock on to our hand, or did initially, but then stopped for no apparent reason. Interestingly, our left hand was much more successful than our right, but we have no idea why. Mindgames. Other gestures include the selfie gesture, which involves making a rectangular box shape with index fingers and thumbs, or trying to get its attention by holding your arms up in the air. This didn't work that well in our testing. When done, simpy hold a flat palm beneath the drone and it detects it using the sensors on the underside of its body, to then lower and land. Thankfully, this one did work virtually every time we tried it. A remote would be handy in the instance of it not working, though. Flying with a remote control is a much less tempramental way to control the DJI Spark. If you buy a controller, it's pretty much identical to the Mavic Pro's controller - it just doesn't have a built-in status screen and your smartphone connects to it wirelessly (and not using a Lightning or USB connector-equipped cable). While you don't need a phone slotted into the controller, adding one does make it easier to select various flight modes, view status indicators and the live camera feed onscreen. If you've flown a DJI drone before, particularly the Mavic Pro, controlling the Spark will seem immediately familiar. Like the Mavic, you can select the ActiveTrack mode, which means you can select an object or person for the camera to follow. There are two types of ActiveTrack flights: Trace tracks a target from behind or in front, or can circle around it; Profile follows a subject from a fixed perspective, moving the camera. Both types of active tracking worked well in testing, although we would suggest ensuring there are no potential obstacles anywhere near the drone. It's not able to avoid anything to the side, or behind it, only in front. This frontal avoidance system is useful though. It's stopped us flying the Spark into trees, and has even ensured the drone backed away from us if we walked to closely to it. As well as the intelligent flight modes and gesture flying, the Spark is equipped with a number of technologies to make flying it easier than you might imagine. Automatic adjustment for wind ensures the drone can hover in a breeze, although we did see a lot more correctional moving in wind than what we'd seen on larger drones. Due to being smaller and more lightweight, it seems it has to work harder to stay stable. Like its bigger siblings, the Spark's GPS and GLONASS location systems can be used to see exactly where the drone is using the birdseye view map within the app. It's also used to record your home take-off location. When the Spark's battery drains too far, or you somehow fly the drone outside of its 1.2 mile range, it'll automatically attempt to return to this location. In our testing it did this reliably, although it didn't land exactly where it took off, but it was to within a few metres. If you fly in windless conditions at a steady, slow pace, DJI says you can get up to 16 minutes of flight time. In our experience, using it as any regular user would, with at least a little wind, we got somewhere between 10-12 minutes before the low level battery warning kicked in and we had to fly back to base for recharging. The Spark's camera is balanced on a dual-axis gimbal which, along with the drone's own stabilised flight, does a decent job of creating a smooth footage. You can see a live streams through the remote to your phone in 720p HD while you're flying, which is lag free and clear the entire time. End results are decent too. While the Spark seems to struggle a little with contrasting light levels in automatic mode, in good light it produces lots of rich colour. Capture is Full HD 1080p - so higher resolution than the live stream - which, while decent, means you don't get the same 2.7K/4K level of detail of high frame-rates as the more advanced drone cameras out there. Considering how small the Spark is, we're pleased with how well a lot of images and footage came out. They don't quite compete with bespoke cameras, but the response to light and overall sharpness will give your smartphone a run for its money. Plus your smartphone can't fly. There are plenty of small drones out there, but almost all of them are essentially toys and couldn't be considered as portable, high-end flying cameras. The Spark, on the other hand, could be. Not to Hollywood movie levels, but it's still highly capable of capturing decent footage. However, one area that needs improving, as with most drones, is battery life. Going out knowing the battery may only last for 10 minutes of flying time isn't ideal, no matter how convenient and small the drone. Because of this, and how inconsistent the gesture control mode is, we'd recommend buying the Fly More Combo package. This comes with a spare battery, the physical remote control, propeller guards, and a battery charging hub for recharging up to three batteries at once. It's pricier, at £699 rather than the £519 of the standard drone package, but you're more than likely going to need all of that kit anyway. For a first attempt at something so small and so well-equipped, the Spark is fantastic fun. There's also nothing else like it on the market right now, which makes it a drone with little to no competition. Given that the Spark really has no comparable product in its size, the Mavic Pro is the next best thing to consider. It's a more serious drone that's just as easy to fly. It's bigger, more feature packed and has a better camera and gimbal system. What's more, it folds to the size of your average drinks bottle for easy portability.